Since Congress amended the Clean Water Act in 1990, the United States has made great strides in managing water quality, particularly in implementing legislation to limit the direct discharges of sewage and industrial wastes into streams and rivers. And we have advanced our thinking about water resources by seeing the entire watershed: planning and implementing actions and policies based on the geographic or hydrologic structure, rather than on political boundaries. However, we too often view watersheds in terms of streams and rivers and the land draining to those surface waters. Rarely do these studies and policies recognize the interconnections between the water systems of the surface and those beneath the surface  the interconnections between surface water and groundwater. But effective management of water resources demands that we know the contributions of groundwater, which can be substantial. For example, more than half of the water and nutrients that enter the Chesapeake Bay travel first through the groundwater system. Determining groundwater contributions to surface water is a critical step in meeting water-quality standards and criteria, and in issuing permits and controlling discharges of wastes. Typically, groundwater inputs are not included in estimates of contaminant loads. Yet, in some cases, water quality cannot be managed effectively without considering groundwater inputs. Section 303(d) of the Clean Water Act requires states to identify waters that are impaired by pollution and to establish a Total Maximum Daily Load (TMDL) of pollutants to ensure that water quality standards can be attained. The TMDL quantifies all pollution sources, including direct municipal sewage or direct industrial discharges, as well as nonpoint, or non-direct, sources. Excluding groundwater fromTMDLs may prevent a full accounting of all available pollution sources and thus limit how effective a tool TMDLs are for restoring and protecting streams. In turn, surface water can affect groundwater. People often think that untreated groundwater is safe to consume. But drinking-water wells near streams can host the same contaminants and degraded, potent compounds as the surface water. An overview of the past decade of studies by the U.S. Geological Survey (USGS) National Water-Quality Assessment Program (NAWQA) illustrates the increasing importance of considering groundwater and surface water as a single resource. Examples from findings in 36 major river basins and aquifer systems across the nation demonstrate that aquifers discharging to streams can contaminate surface water and that, conversely, streams can be a major source of contamination to aquifers. The studies show that these interactions are often difficult to observe and measure. And, adding to the complexity, natural features and human activities can effect seasonal and landscape variations. Documenting these interactions is difficult, but understanding them is critical to water management. We cannot manage our waters with a uniform plan. Instead, management and protection may require targeted actions based on local and regional environmental conditions. By understanding where contaminants occur, where they originate and what processes control their movement, we can set the right priorities in managing the streams, aquifers and watersheds that are most vulnerable to contamination. We can also increase the cost-effectiveness of policies designed to protect water resources within diverse environments and land uses. Understanding groundwater and surface water interactions is critical in developing water-management strategies and policies that meet the goals of the Clean Water Act: that we can safely swim in and fish our waters, and that our drinking water is safe and our aquatic communities are healthy. Exchanges between groundwater and surface water vary among different landscapes. What governs these exchanges are soils, geology and hydrology. Groundwater and surface water exchanges are significant in carbonate aquifers near San Antonio, Texas. Major streams lose substantial amounts of water to the Edwards aquifer as they flow across the highly permeable, faulted and fractured carbonate rocks of the aquifer outcrop. Fortunately, streams that recharge the aquifer originate in, and flow through, what is now mostly undeveloped rangeland. However, these streams also flow through northern San Antonio, which is being developed. Some contaminants that are typical of urban runoff are finding their way to the recharge zone. For example, a 1996 to 1998 study of wells in the recharge zone detected elevated concentrations of the herbicides atrazine, deethylatrazine, simazine and prometon. Water quality in the Edwards aquifer and in the recharging streams is a critical management issue for the region. The aquifer is the principal water supply for the more than 1.5 million people in the greater San Antonio region. Groundwater and surface water interactions in the sand and gravel aquifers of the Albemarle-Pamlico Drainage Basin in North Carolina help to explain elevated phosphorus in selected streams. Deep groundwater underlying parts of the Coastal Plain has relatively high concentrations of phosphorus (a median concentration of 0.25 milligrams per liter), which likely originates from phosphate minerals, such as fluoroapatite, in the Cretaceous-age aquifer sands. 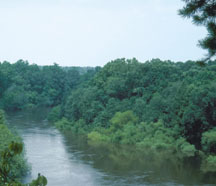 Upward discharge of the groundwater results in elevated levels of phosphorus in streams, particularly in the Tar River and Neuse River drainage basins. Research indicated a significant correlation for 25 sites sampled during August and September 1995 between concentrations in discharging groundwater and in streams. Documenting this natural source of phosphorus in the Albemarle-Pamlico Drainage Basin has helped water-resource managers to better account for phosphorus sources, and has helped in making more accurate Total Maximum Daily Load estimates for some North Carolina streams. Significant exchanges of water and contaminants from the land surface to the groundwater also can occur in permeable and well-drained alluvium and sand and gravel. Along the Platte River in central Nebraska, the chemicals farmers use for their crops can, during high streamflow, enter the adjoining sand and gravel aquifers. The results are elevated levels of nutrients and pesticides in the groundwater. A 1995 NAWQA study detected elevated concentrations of the herbicide atrazine in observation and public-supply wells in the Ashland well field, the source of almost all of the public-water supply for the city of Lincoln. These elevated concentrations, reported as high as 20 micrograms per liter, exceeded the Environmental Protection Agencys maximum contaminant level for atrazine of 3 micrograms per liter. The atrazine was traced to the Platte River. Natural processes can help reduce chemical exchanges between groundwater and surface water, such as through sorption onto soil particles and chemical and biological conversions. Through denitrification, bacteria can convert nitrate to innocuous, gaseous forms of nitrogen when groundwater passes through organic-rich streambed sediment that is low in dissolved oxygen. In South Carolinas Santee River basin, shallow groundwater beneath a cornfield adjacent to Cow Castle Creek had concentrations of nitrate nearly three times the EPA drinking-water standard of 10 milligrams per liter. This concentration decreased to about 5 milligrams per liter as water moved toward the stream and decreased even further to only 0.4 milligrams per liter as the groundwater moved upward through the organic-rich streambed. USGS scientists studied denitrification in southern New Jersey using a 3-D model of groundwater flow that simulated the movement of nitrate through the shallow aquifer system to streams and public-supply wells. Modeled concentrations of nitrate matched measured concentrations in public-supply wells. They verified that the nitrate remains relatively stable as it moves through the aquifer. However, modeled nitrate concentrations in three streams during times when most flow is derived from groundwater were about 60 percent of the nitrate concentrations measured over nine years. The apparent loss of nitrate in streams indicates that about 40 percent of the nitrate was removed by denitrification in the aquifer near the streams or by processes in the streams. Pumping groundwater, using chemicals and irrigating crops can significantly affect exchanges between surface water and groundwater. In the South Platte River Basin in Colorado, hundreds of water-withdrawal structures, dozens of reservoirs, and several thousand pumping wells have significantly altered the natural hydrologic system. These changes have affected the quantity and quality of water in the South Platte River and nearby alluvial aquifer. Groundwater discharges to the South Platte River during fall and winter. Seepage of irrigation water from agricultural ditches and fields replenishes the alluvial aquifer during spring and summer. But the irrigation water carries nitrate, dissolved solids and pesticides, such as atrazine and prometon, from farms into groundwater. These substances are then transported into the streams and river. Because water is withdrawn all along the Platte River and then replaced by groundwater, the water is effectively recycled or reused as it moves downstream. As a result, salinity has increased in a downstream direction in the river and shallow alluvial groundwater. The salinity increases are caused by evaporation, solution of soil minerals and concentration of salts in the soil zone as plants use soil moisture. Elevated salinity makes the water less suitable for irrigation and drinking. 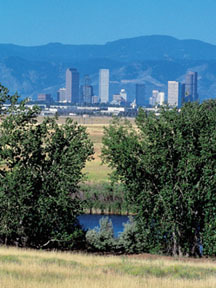 Looking west toward Denver from the plains and the South Platte River (foreground). Copyright Michael Mauro. Printed with permission, supplied courtesy of the USGS. Agricultural practices can control the degree to which surface water and groundwater are exchanged in many parts of the Midwest and Southeast. In these regions, tile drains and ditches are used to extract moisture from poorly drained and clayey sediment. The effect is to short circuit the groundwater system by intercepting soil water and shallow groundwater and transporting it to streams. As a result, streams in these areas can have elevated concentrations of agricultural chemicals; seepage into the ground is minimized, thereby resulting in lower concentrations of chemicals in groundwater. Knowing these hydrologic interactions is critical to managing and protecting both the streams and groundwater in these areas. Pumping typically increases exchanges between surface water and groundwater. In the Cedar River and in alluvial wells in Cedar Rapids, Iowa, significant pumping from public-supply wells induces infiltration from the river, allowing contaminants in the river, such as pesticides, to move into groundwater. Contaminants often detected in groundwater wells include pesticide degradates, which are different forms of the chemical after transformation through natural processes. These degradate compounds can be more toxic and persistent than the parent compound. Few of them are regulated with drinking-water standards, and they are sometimes found at concentrations 10 times the concentrations of their parent compounds. Based on these USGS findings, local officials in the city of Cedar Rapids, which obtains its water from the wells close to the Cedar River, have mandated monitoring and analysis of the herbicide degradates in groundwater used for city water supplies. Miller is chief of the National Water-Quality Assessment program. This article is based largely on the U.S. Geological Survey series, Water-Quality Assessments in the Nations Major River Basins, which address local, regional, and national water-quality issues (USGS Circular Reports 1151-1171 and 1201-1216). These reports are available online. Visit this site to access other reports, data and maps of chemical use and occurrence.